We're scouring the web at a frantic pace to bring you the best Cyber Monday deals around and we found one heck of a bargain in graphics cards. It's for the factory overclocked Asus Dual GeForce GTX 1070 (DUAL-GTX1070-O8G), which can be had for as low as $329. The exact price depends on a few different factors. It's offered by Jet.com and if you're a new customer, you stand to save the most. First, head over to the product page here. The regular price is $390, though there a few options to get a better deal (you'll see them after you register and log in). You can opt out of free returns and knock it down to $382.97, pay by debit card and see it reduced to $386.87, or opt for both and watch the price drop to $379.91. That's already a good bargain, but if you're a new customer, coupon code TRIPLE15 knocks 15 percent (up to $30) your first three orders. That brings the tally down to $349.91. We're not finished. Asus is offering a $20 mail-in-rebate for this card. You can find the form here (PDF). That brings the final price down to $329.91 if you're a new customer, or $349.91 if you're not. Either way it's a really good deal for a fast card. The Asus Dual GeForce GTX 1070 has a 1,582MHz base clock and 1,771MHz boost clock in Game mode, and 1,607MHz/1,797MHz base/boost clocks in OC mode. Both are above Nvidia's reference design, which calls for the base and boost clocks to be 1,506MHz and 1,683MHz, respectively. Bear in mind that you can use the TRIPLE15 code on other products as well, including an even faster clocked GTX 1070. 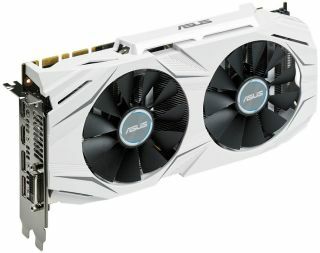 If utilizing the same options as above (opt out of free returns and pay by debit card), the Asus ROG Strix GTX 1070 is knocked down from $430 to $388.87 with coupon code, plus another $20 comes back via mail-in-rebate. The clockspeeds on that one are 1,632MHz/1,835MHz (base/boost) in Gaming mode and 1,657MHz/1,860MHz in OC mode. For more deals in graphics cards, be sure to keep an eye on our Best Cyber Monday graphics cards list along with our Best Cyber Monday deals all around. It appears as though the coupon code TRIPLE15 is no longer working. Assuming it doesn't come back, you can use coupon code EXTRA20 to knock 20 percent off, up to $30. It has the same effect on the above deals as TRIPLE15, except that it applies to one order only.